Saturday was Jim Henson's birthday; he would have been 75 years old. If you spent time online Saturday you may have seen Google pay homage to Henson with this Google Doodle. 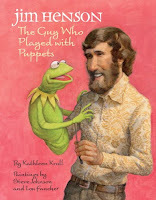 Jim Henson: The Guy Who Played with Puppets shares the magic of Jim Henson with a new generation of readers. The picture book biography by Kathleen Krull follows Henson as he grew up in Leland, Mississippi in the 1930s. Henson loved to create and draw, and he was interested in nature. Upon entering high school in the 1950s, Henson joined the school puppetry club and went on to take puppetry and costume design courses in college. After graduation from college and a short stint in Europe, Henson formed a new company...Muppets, Inc. His career took off when a t.v. producer offered Henson the chance to create puppets for Sesame Street, for a new children's program. Most readers will be familiar with Henson as the creator of The Muppet Show and the series of Muppet movies. However, many children may be surprised to learn that Henson also created characters (such as Yoda) for the Star Wars films. Krull writes in a clear and concise manner that young readers will understand. Each page of text is accompanied by a colorful, full-page painting by Johnson and Fancher on the opposite pages. Smaller illustrations of Muppets fill the margins below the text. This picture book biography is an excellent introduction to the creative genius of Jim Henson. Students working on research projects may want to read Who Was Jim Henson? by Joan Holub for more details about Henson's life and work. Wasn't that a great Google Doodle? 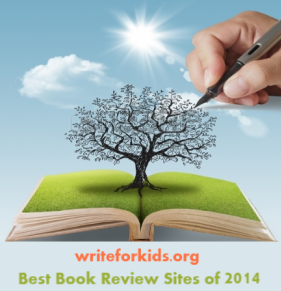 Thanks for a great review and for participating in Nonfiction Monday. I'll have to take a look at that one since I was squarely in the target demographic for the original Sesame Street. Congratulations on being named to the Cybils panel!